In these trying times of rampant negativism and division, exclusion, and disrespect, it is oh so refreshing to come together as a community and affirm the positive values of DIVERSITY, INCLUSION and RESPECT… And that is what we just did last Sunday at Veterans Plaza in Silver Spring to shout out that we will STAND UP, THE MONTGOMERY WAY! These are not just words of platitudes, shallow words, or simply about singing kumbaya. No. This is about recognizing that at this moment, we need to give thanks for our diversity, give thanks for being inclusive, and give thanks for being respectful. And we want to shout out for everyone near and far to hear: This IS the Montgomery Way! We are here to stay. We are not going anywhere. We are part of the fabric of an empathetic, caring, and – yes – beloved local communities throughout these (dis)United States. For this amazing community we give thanks. We don’t know what the future holds. But we do know that if we remain a diverse, inclusive, respectful community – and stand up for and with each other – we will continue building this hyper-local, vibrant, and thriving beloved community we call home. How Trump’s calculated criticism of the established liberal elite institutions works for his empire building and con-game. > He bashed the cast of one of Broadway’s most successful play ever, Hamilton, for reading an open letter of dissent in front of the Vice-President elect. > He scolded one of the most successful late night shows ever, Saturday Night Life, for making fun of him in a parody skit. > He reneged at the last minute and did not meet with one of the most read newspapers ever, the New York Times, exclaiming that they cover him ‘nastly’. Make no mistake about it: THIS is what awaits us during the Trump Presidency. Any illusions of normalcy, expectability, tradition, or protocol is out the window. The only constant will be unpredictability. Yet it is a ‘calculated’ unpredictability. In this most recent case, he very intentionally chose three bastions of culture his opponents embrace and his supporters abhore: Broadway, late night t.v., and traditional press. So be it. We will have to live with it. We certainly don’t have to like it. But, it is what it is. Clearly we have a President-elect who rather drive wedges into a divided nation feeding the frenzy of his supporters without making any attempt to reconcile with, unite, and reach out to those that voted against him – incidentally: a majority of voters, by at least 1.5 million votes! Yep. We can withdraw… We can cocoon ourselves in our daily struggles and our private pursuits without worrying about the craziness around us, how others are being impacted, or what is happening around the world. We can become Trump’s zombies. The land of the walking dead. Sleep at the wheel. Enjoying the moment in our own boxed-in, limited universe. > Ultimately, you can choose to simply be a most casual observer of this emerging American tragedy. Frankly, it is kind of easy to withdraw. If is easy to withdraw if you are part of the seemingly majority of Americans who does not know an undocumented youth who has become a Dreamer after trusting the Federal government and providing all his/her contact information only to now be in the danger of this being his/her last Thanksgiving in the United States because of deportation threats if DACA goes away. It is easy to withdraw if you are part of the seemingly majority of Americans who have never met a Muslim family, dined with them, conversed about their journey and aspirations. It is easy to withdraw if you are part of the seemingly majority of Americans who have no clue that your cousin is gay and he/she had to move away from the family because no one would understand – much less accept – them. It is easy to withdraw if you have never visited predominantly White. poor Appalachia and know the depth of despair of a family who tells you their only saving grace is now being covered by an insurance plan without regards to pre-existing conditions; and is now hearing that small step forward in coverage is about to be rescinded. It is easy to withdraw if you are part of the seemingly majority of Americans who have never sat down with a woman wrestling with the wrenching decision whether to have an abortion or not; and instead you want to condemn her and send her to jail instead of seeking to implement – and collectively pay for – policies like prenatal care, universal healthcare for newborns, and early childhood education. It is easy to withdraw if you are part of the American majority that are ok with demeaning the Office of the Presidency and turning it into a play thing for a show-man, a man who has clearly conned the seemingly majority of America. However, to many of us, withdrawing is not an option. We will continue using the arts, entertainment, and the press to fight back; to make our point; to disagree and dissent. You see, there’s this pesky little thing called The First Amendment that we happen to believe in and even the President of the United States of America cannot so easily dismiss. So now we turn only to those with whom we agree. We visit only websites that feed our bias. We visit only with friends and family that are willing partners in building our silos for our ideas. I happen to proudly live in a community that is very left-of-center. “Progressive”, some may call it. I work for the local County government, with all elected officials from the Democrat Party. My wife works for the Federal Government, in HIV/AIDS no less – a bastion of progressive thinking. Our community has a very high concentration of people from the ‘do-good industries’: non-profits, federal agencies, progressive think tanks, and the like. Yet, there is are certain common outlook on life that most of us spouse binding us together in the community where we live. And, many in our extended family and friends throughout the country (and the world) share similar outlook. But others obviously don’t. Our outlook is rooted in an understanding of humanity as a positive force. An understanding that most people are good people, regardless of their personal individual experience – and regardless in what part of the globe they live or where they are from. This outlook is rooted in an understanding that community matters; that caring for each other is a good thing; and that institutions and governments are expected to be participants in doing good. For most of us in this community our outlook is shaped by life experiences that include extensive interaction with people from elsewhere and from across the economic spectrum – either directly or indirectly. Most of us have a life story that have taken us to places beyond our comfort zone, either physically or metaphorically. And for those in our community that have been around here a long time, for many generations, the outlook is one of welcoming the new people as a positive and constructive ‘value added’ to the community. This outlook on life is in stark contrast from an outlook on life based on absolutes, simple answers, and strict dogma. Our outlook on life is in stark contrast of the outlook on life based on experiences where you perceive others have done you wrong, others are getting free rides, and others want to take over. Our outlook on life is in stark contrast from those who rather hang around only those like them; who don’t think there is anything to be learned from others they did not grow up with or from those that just landed on our shores. If your outlook on life is based on what others have done to you rather than what you can do for others, then we have different outlook. If your outlook is framed by hard edges and strictly defined rules, then it is indeed tough for us to talk. If your outlook is that we need different people seating at the decision-making table rather than – paraphrasing Ike Leggett our County Executive in Montgomery County, MD – what we need is to make the table bigger and invite others that think unlike us to help us make decisions, then we certainly have different outlook. Regardless, onwards we must go. Let’s not fool ourselves: The future will be different from the past. It always has been. So, let’s go make it work – for those like us, those unlike us, those that like us and those that don’t. It would be sweet if we can work together on some stuff. But, if we can’t work together, let’s at least fight decently. Let’s not fool ourselves: Political fights ARE personal fights. If I perceive your political views to put the lives of my undocumented immigrants and Muslim friends at risk, I take it personally. If you perceive my political views to put the lives of unborn babies at risk, you take it personally. We will each use the tools and techniques at our disposition – some with their newfound elected power, others joining the people protests – to do what we can to create a world where our views prevail. Sometimes compromise will be in order. Sometimes conflict will prevail until one side or the other ‘wins’. That is the political process. Let’s not fool ourselves: Political views impact personal relations. If we have similar political views, I tend to want to hang out with you more often, for longer time, for that extra beer or slow cigar. If we have different political views, I tend to move on quickly after saying hello. I cannot separate my faith from my political views. I know that complicates matter, but that is who I am. Faith is what forms my core, unapologetically so. Yet, I find it extremely difficult to understand collective actions driven exclusively by dogmatic, absolute faith that negate the value of people who happen to believe differently. I find it challenging to understand beliefs that negate scientific knowledge. And, I find it impossible to understand killing in the name of God, or simplistically imposing on others laws based on narrow, limited application of any one particular faith system. So, if you are the praying type, I will pray for you. And, as Pope Francis so simplistically eloquently says: Please pray for me. Author Reemberto@gmail.comPosted on November 17, 2016 November 24, 2016 Leave a comment on Let’s not fool ourselves: The future will be different from the past. It always has been. 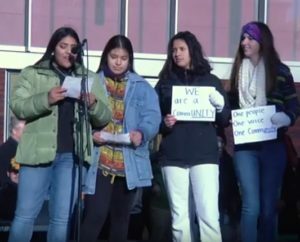 Yesterday students in our community’s high schools took to the street to protest President-elect stated agenda. I could not be prouder of our youth – and the school system and parents who supported this protest. Why did the youth do this? Don’t they get that it is over? Don’t they get that we have a new President? Oh, our youth ‘gets it’! They ‘get it’ all too well! It seems our school systems and their parents have taught them that a person ‘says what you mean and mean what you say’; and that demonstrating decency, respect, inclusion, and empathy are qualities and values of a good citizen… Thank you students. Thank you teachers. Thank you parents. “They’re bringing drugs, they’re bringing crime, they’re rapists,” Trump said of undocumented Mexican immigrants while announcing his candidacy last June. Trump has pledged to weaken the First Amendment, and “open up” libel laws so that public figures can sue and win cases against the media companies. I get that many of these statements are politicking and posturing during the campaign to get elected. I get that he has already indicated he is shifting some positions. I get that President Obama called him a pragmatist… Yet, he said what he said. I have to take him at his word. Mr. Trump, you will indeed be my President. But you do not represent most of my views, nor have you exhibited a behavior that I consider worthy of respect – and therefore I cannot respect you, sir… Respect is earned – not demanded or commanded, even if you are the President of the United States of America. p.s. : This short video titled “Is Donald Trump Mentally Ill?” captures much of our President-elect’s comments – in his own words. Yesterday, President-elect Donald Trump selected Steve Bannon to be his Chief Strategist in the White House. Mr. Trump’s outlandish comments and declarations during the campaign could conceivably be dismissed as politicking and ‘saying what it takes’ to get elected. However, Mr. Bannon’s headlines and journalistic pursuits are clear, unambiguous, definitive affirmation of his beliefs, interest, and where he wants to take America. Mr. Bannon started Breitbart because – in part – he saw Fox News as not conservative enough. Paul Ryan is not his friend. The Republican Party is not his friend! Mr. Bannon will be the CHIEF strategist. The individual that will define how to deal with protesters, climate change, and our international allies. You say: “get over it; you lost”. I say: This is not a game. You say: “it is time to heal”. I say: I am not sick. You say: “oh you are so angry.” I say: That’s right! Angry that we have an indecent, inhumane President-elect. Angry that you want to implement policies that I vehemently disagree with. Angry that my immigrant family, LGBTQ, African American, and Muslim friends are being so insulted, disrespected, and misunderstood by the man coming into the most powerful office in the United State. Angry that defunding critical scientific research, climate change denial, and ideology-based creationism will become the cultural norm. Angry that anti-abortionists were duped into believing (in part by priests in my own Catholic faith) to focus all their attention on the simplistically dangerous and calice tactic of criminalizing abortion by committing to overturn Roe vs. Wade instead of committing to support prenatal care, new-born universal health insurance, adoption programs, early childhood education, and affordable child-care – proven tactics which would do more to reduce abortion than force women to revert to coat hangers. Yep. I am proudly part of the opposition, the insurgency, the resistance. I still love you, mind you. I still will work with you. I still will respect you. AND I still will speak my mind. You see, I come from a proud people who stood up to a dictatorial maniac and paid the ultimate price. Some had no choice but to leave our homeland. Yet today – thanks to President Obama – we are in dialogue with that very same regime. And I welcome that. I get it. But this time I ain’t going nowhere. I am here to stay. Deal with it. Dialogue and engagement, yes. Appeasement, No! When our agendas intersect, I will gladly work with you. When they don’t, I will maneuver and mobilize to oppose you. You may have the political power; we have the people power. We will fight, resist, and protest. We will relearn from our elders and heroes, MLK, Cesar Chavez, and the like. We will mobilize massive resistance that you simply will not be able to ignore. We will use our basic freedom of the press to their maximum our message. We will do what it takes. We will NOT let you take us back in time to an America that was not so great. You to your blind trust in your fearless leader. Us to our common bond with our fearless people.